OK, so here is the place where I should present myself in a little more dept to you? Well, I am born 1973 and I live together with my girlfriend Jenny in Sundbyberg, Stockholm. We have an apartment located at the top floor in a three-storey house and it is consisting of three room and a kitchen. I tend to spend to much time in front of the computer and previously I was quite involved in the Content Management System called Coranto which off course also is used to manage the content of this site. 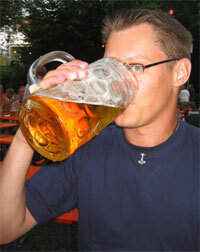 When I am offline I like to spend time with my friends, maybe over a beer. I also like motorsports and enjoy driving my car which is a Ford Focus ST. I also play badminton once a week and usally caries a pocketbook with me which I read if there is some sparetime. Well, I think this is as personal I am going to get for the moment, unless you can reed geek? !PGP t+ 5 X+ R* tv b+ DI+ D+ G e+++ h---- r+++ y? I am system developer with 7 years of experience as a consultant where my main areas is object oriented development in Java and JSP with Unix as main target environment. I have come in contact with Perl, C and C through the years and I have experience of analysis, design and testcases. I have worked with all the arcitectural layers, from database trough businesslogic up to the presentation layer. I like to work in a team and is considered to be diplomatic and a good listener. My strongest personal characteristics is to accuratly and efficiently get the task at hand done. The businessareas I have experience from is banking, e-learning and e-business, but has also been in contact with distribution and retailing. On my free time I have been acquainting myself with Linux (Red Hat and Apache mainly) and have my own server running at home. Heaven Devil, Storvreta IK and Nacka Hockey Team -93 (where Alexander is one of the players) is some sites where I have helped out setting up their websites using the CMS Coranto. Currently I am working as a systemdeveloper at Åhléns Internet shop and a CV can be required if requested.